The YEAR END wrap up! | Badass Concert | Heavy Metal Music News | So METAL, we piss RUST! Home News The YEAR END wrap up! The YEAR END wrap up! Yes yes yes, it’s the most awful time of the year again. Consumerism running off the rails, extra-awful music on the radio, gaudy decorations, ugh. There are some upsides though, like gorging myself and getting inappropriately drunk at family get-togethers, and taking some time to reflect on what’s happened since the last winter solstice. And while we’re reflecting on the past year, I would like to personally thank each and every one of the musicians who submitted their top 5 album lists this year. It’s been awesome to see what goes through the heads of some of my favorite musicians. 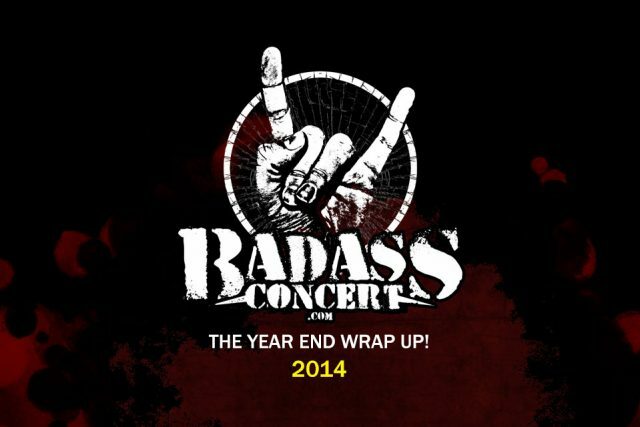 2014 has really been great at BadassConcert.com. We’ve heard a lot of excellent Midwestern metal, been to some mind-blowing shows, and did our damnedest to elevate the bands, music, and friends we love. I really want to thank you (YES YOU!) for coming to this website in 2014, whether you are in a band, are a bartender, sound guy, promoter, venue owner, or most importantly a FAN of local heavy music. I want to especially thank all the bands who have talked with me and shared their music with me over this past year. If there’s something great going on in your corner of our metal universe, email or Facebook me and we’ll do our best to share it with the world!! Interview with A Different Breed’s bassist Chuck Fleming, and drummer Tim Blundell. These guys are one of my favorite bands around, and they are always a pleasure to talk with. This interview includes a bit of an origin story and some goofy s*it from Chuck. Review of Philip H. Anselmo & The Illegals show. Great show; it turned me around on how I felt about PHA&I, in a very good way. Phil is truly one of the best metal frontmen ever. The coolest part though is that old curmudgeon read the article and commented on it! Review of Wet Radio’s “Made Man”. The article is just an outpouring of my love for this band, but the song is just SO. DAMN. GOOD. I cannot f*cking wait until their album comes out. “You like blast beats? Skummer hate-f*cks your earholes with that snare drum. Do yourself a favor and check this out. I am now tempted to just re-post everything that we have talked about this last year, but you can take that stroll down memory lane yourself by clicking the “News” link at the top of BadassConcert.com. One more though. It’s my favorite metal memory of 2014. STORMFEST. If I close my eyes, knock back one or 23 Jagerbombs, I can be right back there. Seriously, best show of the year. Of course the music was some of the best the Midwest has to offer, but it’s being in the middle of all those fantastic, fanatic, frenetic, and ferromagnetic people who show such a passion for local heavy music and their friends who create it, that make StormFest something you hang on to until the next one. If that summary of 2014 didn’t get you moshing, I don’t know what will. Next articleSuperior is scheduled to hit the road next week.